We are a very personalized travel agency, founded back in 1991 and based in Vientiane. We organize all sorts of travel to Laos (we also make extentions to Cambodia, Vietnam, Thailand and Myanmar), following our principles of ethics (respect for people and the environment), and more particularly discovery and cultural tours, trekking, cruises and meetings with ethnic minorities. All tours on this site are for informations. We focus primarily on your needs, which is why our services are 100% customizable. We are passionate about our country, and our dearest wish would be to make you become enthusiastic about it too. This trip will undoubtedly become an unforgettable experience thanks to our know-how and the diversity of Laos. 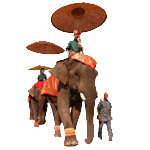 Tours from 4 to 9 days for a full immersion and knowledge of Laos. Nice travel to Discover the Mekong, one of the most fascinating river on this planet. Off the beaten track, enjoy a different Laos for an unforgettable experience. Trekking excursions from 3 to 20 days with camping, hiking and nature pure. In the footsteps of Indochina, embark on a travel that will take you from Cambodia to Laos. April 13-15 every year, the entire country comes to a grinding halt. April 13 is officially the Last day of the old year. The next day is empty, belonging to neither the old nor the New Year. This 15th is the official start of the Lao New Year, or Pi Mai Lao. This is The Time to wash away the past and Wish for a good future. Loa people symbolize this by throwing water at each other, for mutual Purification and blessing. This is just about every-one, everywhere, getting drenched all the time, so don’t expect to stay dry, and join in the splashing fun with the entire Lao population!